Island Conservation was founded in 1994, which means we are approaching our 25th year of impact in 2019. 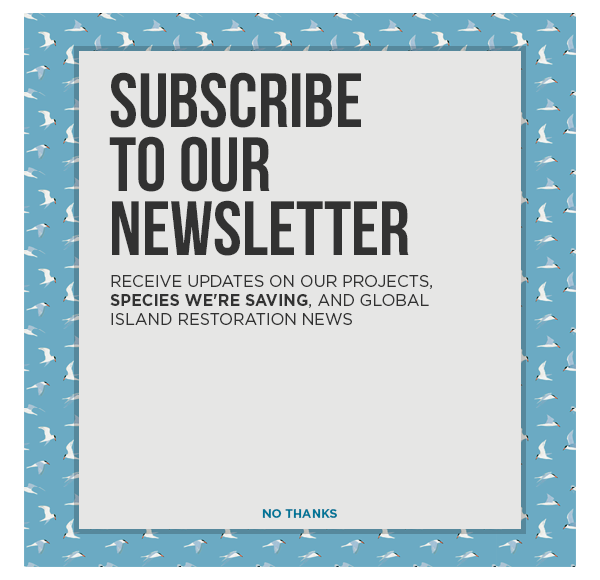 Island Conservation co-founder Bernie Tershy, former Executive Director, Bill Waldman, and current Chief Executive Officer, Karen Poiani, shared a few words about their time at the organization and hope for the future of island restoration. Island Conservation was the brainchild of two professors at the University of California Santa Cruz—Bernie Tershy and Don Croll. As seabird biologists, both Bernie and Don were inspired by the work of Ken Stager on Clipperton Atoll. In 1958, Ken saw the impact feral pigs had on Brown Boobies and Masked Boobies first-hand. He removed the feral pigs and the island started to thrive. Bernie and Don saw that by removing invasive species from islands, you could rapidly and effectively restore entire populations of seabirds. They saw a clear need for an organization focused on preventing extinctions by removing invasive species from islands. Bernie and Don initially started on projects in Western Mexico and then expanded into California. Everywhere they worked, seabirds and other native island species were recovering. They knew they had to start thinking globally. In 2008, Bill Waldman joined Island Conservation as the Executive Director. After working for 23 years at The Nature Conservancy, Bill was inspired to help grow a small but impactful organization into a globally recognized leader in species conservation. This viewpoint not only pushed Island Conservation to tackle new projects in diverse regions around the world but to become leaders in the field of island restoration. It also deepened our commitment to partnerships. Working with partners, we can accomplish more complex projects, such as the restoration of Palmyra Atoll in 2011 and Hawadax Island (formerly known as Rat Island), Alaska in 2008. Karen hopes that as Island Conservation moves forward, innovations can not only make our own projects more effective but can also push the field of invasive species removal further and broaden the scope of what is possible. If the past 25 years have taught us anything, it is that we must keep challenging ourselves to do more if we wish to save our world’s plants and animals from extinction.